Bet Ronda Rousey over Sasha Banks at -1250 with Unibet. Bet Asuka over Becky Lynch at -250 with 888Sport. 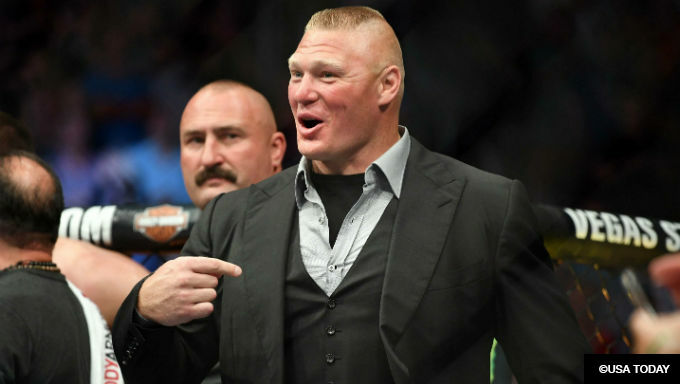 Bet Brock Lesnar over Finn Balor at -455 with Unibet. Bet Daniel Bryan over AJ Styles at -250 with Betfair. The draw each year of the Royal Rumble is of course the Royal Rumble matches. However, the event also brings some big WWE title matches on the men’s and women’s sides that fans of WWE betting are sure to get excited about. The result for each could give insight into what the card for WrestleMania might be. That along with the two who walk away winning the beloved 30-person over-the-top battle royal. Based on the direction things have been going on TV involving the combatants, let’s take a look at how the four matches are shaping up. Ronda Rousey has been embroiled in a cross-brand rivalry with Becky Lynch and Charlotte Flair but have been dealing with Nia Jax on the Raw side. After toppling Jax for the time being she turns her attention to Sasha Banks. It will be the first time “The Bo$$” tangles with the UFC Hall of Famer. Expect a competitive bout (maybe even some interference from Natalya and/or Bayley? ), although one would expect Rousey to retain. Bet on the heavily favored at -1250 with Unibet. Asuka snuck in between the Becky Lynch and Charlotte Flair issue to become the champion at TLC: Tables, Ladders & Chairs. Lynch earned herself a title match against the “Empress of Tomorrow” at the Rumble. With things not settled between Rousey and the fact Asuka won the title only a few weeks ago, the odds are not in Lynch’s favor. It might turn into a busy night for “The Man” as there is also the possibility she may find herself in the Royal Rumble. Take Asuka at -250 with 888Sport. Up until recently Braun Strowman was scheduled to take on Brock Lesnar at the first WWE Pay-Per-View of the year. An injury put the “Monster Among Men” on the shelf, but the company continued to advertise him for the marquee match. Fans were led to believe Strowman would be ready when he defeated Baron Corbin to maintain the opportunity. However, it was not meant to be and Balor shocked audiences by pinning John Cena on Raw to win the match against Lesnar. It’s the ultimate David vs. Goliath matchup. The question on many minds if Balor is going to break out his alter ego “The Demon,” which is known to give him a little more intensity against someone as imposing as Lesnar. No matter what Balor enters Chase Field, Lesnar is still the favorite to retain. Grab Lesnar at -455 with Unibet. Daniel Bryan has completely changed his trajectory after turning heel last year after a Herculean comeback story. Since the character jump Bryan has had Styles’ number. Another part of the story has been Vince McMahon bringing out more aggression out of Styles on the road to this rematch. I feel Bryan is just getting started with the persona change and having the championship adds another layer to it. There has also been some speculation regarding Styles’ contract. Couple this with the fact the “Phenomenal One” is coming off a record-breaking title run. It’s hard to think of the company putting the title back on Styles so soon. I think it all points to Bryan retaining. If he isn’t busy with Shane McMahon, it would be an interesting twist to see The Miz as a face square off against a now villainous Bryan given their long history. Back Bryan at -250 with Betfair.